The NRL has announced an initiative which will see a purpose-built rehabilitation academy established for off-field offenders, with the completion date set down for the 2019 pre-season. The state-of-the-art campus will be home to numerous features including education workshops, gyms and playing facilities, with a village that can accommodate up to 950 players at any one time. The NRL plans to fund part of the project using funds from Mitchell Pearce’s Australia Day fine, with confidence high it will provide the game with a much-needed change of current punitive protocol. From now on those called before the Integrity Unit will no longer be subject to an inconsistent set of punishments determined by factors like reputation and what Wayne Bennett thinks, and will instead be hidden in a quasi-penitentiary until it all blows over. With rugby league akin to bad behaviour in modern times, the rehabilitation centre is a sign competition bosses have finally relented and taken ownership of the code’s issue of the debaucherous conduct of young Gen Y males. By sequestering the problem inside a highly secure yet luxurious facility, they say it demonstrates the game is taking responsibility for its troublemakers. They believe there is no better way to cement the game’s willingness to grant everyone a seventh chance than with another knee-jerk revenue-vacuuming initiative. Named the Julian O’Neill Centre of Excrement, the facility aims to empower footballers to learn new skills and advance their personal development. ‘Inmates’ will be trained in highly-intricate life skills such as toilet etiquette, animal rights and knowing when to simply not do anything. At the completion of their sentences, graduates will be eligible for selection in the National Remand League All Star XIII, with selectees to be presented with the coveted Guantanamo Orange jersey in a ceremony at Long Bay. While yet to be confirmed, it is rumoured the team could also play off against the NRL All Stars for the game’s ultimate prize – parole. “This centre combines the best quality facilities with the lowest quality humans” he beamed. “No expense has been spared. “It’s mostly made of fibro, the preferred wall material for those with anger issues. 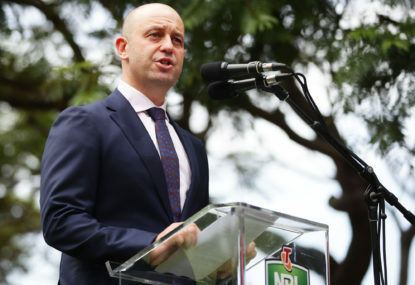 The facility is set to be open by a yet to be named dignitary of debasement, with the NRL believed to already be working through a shortlist of thousands. Now that it’s after midday we can reveal that this is indeed an April Fool’s piece.